Friday, 26 October 2018, marked the beginning of a career in the food and beverage services for 10 previously disadvantaged young people, when they received a Cater Care Certificate. Students successfully completing a 6-month level 1 skills program at the François Ferreira Academy (FFA) in George. 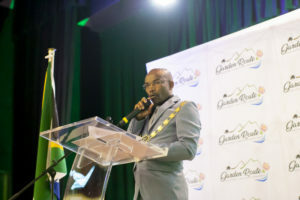 As from 2011, the François Ferreira Academy has been working closely with the Garden Route District Municipality (GRDM) on the Cater Care Programme and later became the sole sponsor of this successful programme. The programme provides learners with the basic skills in food preparation and food and beverage services, which makes it perfect as a feeder programme for courses such as the National Young Chef Training Programme presented by the National Department of Tourism in association with the South African Chefs Association. The 10 students, who started on 12 March 2018, were the second group for 2018. The GRDM’s tourism unit sponsored R200 000.00 to train 20 students in the tourism and hospitality sector. The core responsibility of the district municipality is to coordinate the enrolment of trainees through a formal recruitment and selection process. Back row fltr: Councillor Rowan Spies, Mr Lorenzo Sass, Ms Rozanne May, Mr Goodman Mvubu, Ms Pheliswa Kewuti and Mr Siyamthanda Thota, Mr Aphiwe Dyantyi and Mr Avuyile Raymond Qodi. Front row fltr: Chef Francois Ferreira – Principal of FFA, Ms Fazlin Wildskut, Ms Joneen Boesak, Ms Kaylene Verland, Ms Denise Lindley – Vice Principle of FFA and Councillor Jerome Lambaatjeen. During the certificate handover ceremony, which was attended by family and friends of the students and councillors of the GRDM, the founder and Principle of the academy, Chef Francois Ferreira gave a brief background of the institution. He also gave an overview of the programme’s subjects and shared success stories of previous Cater Care students. Many of who furthered their training and became professional Chefs, currently working overseas. He explained the aim of the programme is to ‘take’ unemployed youth; train them and place them into sustainable jobs or some become successful entrepreneurs. Furthermore, Chef Ferreira announced that 9 of the 20 students of the whole group have advanced to the Assistant Chefs Programme, presented by the Academy. Chef Ferreira concluded and said that the Cater Care Programme has a drop-out rate of 0% students; a 90% success rate in placing students in sustainable jobs. He also mentioned that 70% of students further their studies in the culinary field by obtaining higher qualifications. A happy group of student with some of the utensils they used during their training. During interviews conducted with a few students after the ceremony, it became evident that this programme definitely changed their perception of life, and that they see it as a doorway to a successful future in the hospitality industry.